What do we do – locally? What do we do – as a region? What do we do – internationally? This Year’s Meetings – were you there? Things to do – places to go! In President Sharon’s second year we raised money for Manna’s Ark which is a new venture. It’s an informal learning centre building on basic life skills. Children get to be outdoors and see the animals & have fun whilst learning. The money we raised is going to pay for the planting of a sensory garden. Sharon has been helping build the paths in readiness! In President Sharon’s first year we supported Southend YMCA’s SOS Bus. They have provided professional first aid provision for events across Essex. They are dedicated to the advancement of first aid across the County and provide a range of courses to help local individuals & organisations to meet health & safety requirements, empower their personnel & ultimately save lives. 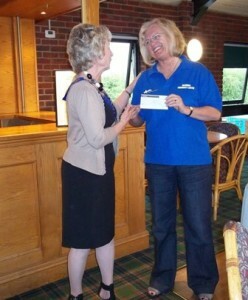 In President Margaret’s year, the club raised well over £1 000. The money was used to support the club’s Relationships Education programme by supplying Loves Me, Loves Me Not bookmarks to secondary school pupils in the area. Working with Southend Safeguarding Committee, these were distributed in conjunction with a drama ‘Prince Charming’. The club also supported other local projects like HARP – the charity that supports the homeless, donating funds and food, warm hats, gloves and scarves. The bulk of this year’s President’s Project funds are being used to promote our STOP the TRAFFIK Gift Box – it’s costly to put this event on, but well worthwhile! President Chris has nominated COPES as her charity for the coming year. COPES is a Southend based support group for women who have suffered Cervical, Ovarian, Perineal and Endometrial cancers. At our meeting in May 2014, President Elect Victoria, introduced Emma Azeem, one of the specialist gynaecology oncology nurses from Southend Hospital who runs the COPES group, and Sue Soper a member of the group. They spoke about the work of the charity, which is based at Southend General Hospital. The group meets on the first Saturday of the month and they provide information, advice and support in a non threatening, non pressured environment. Attendees meet specialist nurses for information and advice, find out about local services and meet other women in similar circumstances. Sue, who had ovarian cancer herself 7 years ago, reminded members that as there is no screening programme for ovarian cancer we need to be symptom aware and seek advice if worried. The group holds fundraising events and the money goes towards research and equipment etc.. They are currently fundraising for unique specialist laser equipment. President Sharon nominated Women’s Aid as her project for the two years of her presidency. We already support the refuges in Basildon and Southend by providing a Welcome Bag of toiletries for the women who seek their help. Our fund-raising enabled the club to give them a cash donation which Sharon presented at our meeting in May 2014. 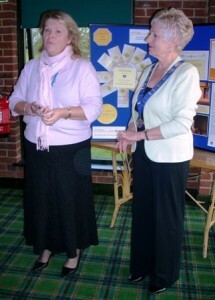 Southend Young Carers was the chosen project for President Cathy in 2011 – 2012. President Cathy invited Angelina Clarke from Southend Young Carers to tell us about their work at the beginning of her year and throughout the year we raised money at our social events for their cause. Young Carers don’t get the same amount of time as other young people, to do their own thing! Their duties as carers often set them apart from others of their own age and the Young Carers group tries to enhance their lives by providing a social network for them. Cathy asked the club to support the group as her nominated President’s Project for the year. By the end of the year we had raised £1 650. Angelina quickly organised a Saturday morning networking group which will run for a whole year and a six-week Street Dance course for the young people during the summer holidays – our donation was just £3 short of covering the whole cost of these activities, so the club is delighted to have been of some help. 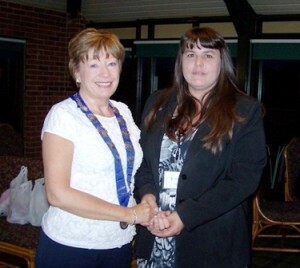 President Janet introduced Stephanie Stamp to the club at our first meeting in her year. Stephanie and a couple of her friends had bought the Balmoral Centre – a crumbling community centre in Westcliff – and have transformed it into a ‘heart’ for the community, which includes a whole range of minority ethnic groups. 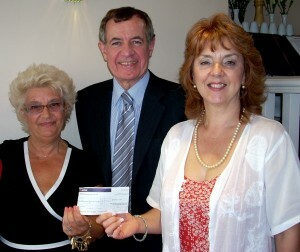 The club raised £1 106.88 which was given to Stephanie at the AGM in April 2011. Stephanie thanked members for their fundraising efforts and their support for the Project. She went on to explain that they are currently involved in trying to set up help for the Czech and Polish Roma community who are very wary of authority in any form as they are treated so badly in their own countries. She asked if the club were happy for some of the money to be used for the Street Tough Challenge children to have a day out at the International Scout camp in Brentwood where they will be able to face up to their fears and challenge themselves to do an activity such as abseiling or rock climbing. The club agreed that it is a very worthwhile way to spend the money they raised! President Jackie encouraged the club to support the Southend Sunflower Trust and by the end of her year, we had raised £1 222.50. During the year the club held lunches, coffee mornings and pamper sessions and all our events were very well supported by our members and their friends. Some of our members walked a half marathon, though this might not be in our schedule in the coming year! We didn’t charge huge admission fees and usually held a small raffle – our Social Committee believe that the social aspect of the events is just as important as the fund-raising to our club. We take our responsibility for being an active and friendly club very seriously – after all, Soroptimism is all about Programme Action and Soroptimists make the best sisters! President Betty has always supported NSPCC, and chose this charity again for her President’s Project. When the cheque was presented to Clare from NSPCC, she spoke of Betty as ‘legendary’ and praised her magnificent work in Essex for NSPCC – she was delighted to meet her at last! We have previously supported NSPCC’s Child Witness Support scheme, now based in Colchester, which enables children to give video evidence in court. During 2008 – 2009, Betty asked members to support NSPCC again, and £1 000 was raised for their projects. This will probably go towards funding Child Line in our neighbourhood. The money was raised in two events – a summer barbecue and a lunch. Soroptimists do like their food! President Jan was delighted that the club’s fund-raising activities for Fair Havens were well supported through the year and we raised £1 600 for the local hospice. Events included a Weekender’s clothes party, the sale of President Jan’s handmade jewellery, a successful BBQ and a Silent Auction. A big fund raiser was our Indian meal at the Maharaja Indian Restaurant and a new event this year was a wine tasting – an evening much enjoyed by all! The total raised for Fair Havens was £2 000. At the beginning of the year, President Janice set out to enthuse the club in raising funds for MIND – a charity that supports those with mental health issues. A range of events was organised – a Fashion Show, a lunch on Canvey Island and spectacular Musical Evening, when talented harpist Camilla Pay came to Southend and entertained Soroptimists, friends and guests. She was ably supported by organist David Sandercock and the programme was varied and light-hearted. President Janice was touched by the support given by friends, family and the club to this so-called ‘Cinderella’ charity – as mental illness can’t be seen, it doesn’t raise the sympathy that some other charities do. In 2005 – 2006, President Sharon nominated Fledgelings to benefit from our club fund-raising. This project gives support to children, as part of the Dove Project and Southend Women’s Aid, which we have helped in the past. The Fledgelings project enables children brought to the refuge by their mother, to see their father or paternal grandparents under supervised conditions. It means that grandparents, who, through no fault of their own, may not see their grandchildren, can enjoy some time with them. The project also provides a comfortable and safe environment for children to talk about things that worry them. The club raised over £1 000 by holding a Music Quiz, a Silent Auction, a curry evening and several smaller functions. 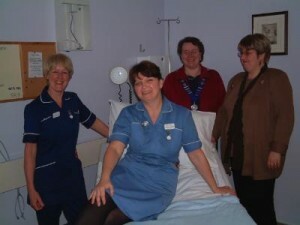 In 2004 – 2005 President Lysette supported the Eastwood Ward of Southend hospital – our picture shows Lysette with newly installed President Sharon and two of the Eastwood Ward nurses.